You will love staying in this bright, clean, and modern home! This home features three bedrooms and three full bathrooms, with two of the bathrooms as private en suite in the upstairs level. The upstairs level also features a loft with a pull out sofa for extra sleeping space. With sleek and comfortable furnishings and a fully stocked kitchen you will have everything you need for a truly enjoyable stay in Tucson. Located in the historic armory park neighborhood you can easily walk to some of Tucson's best and most unique restaurants and enjoy all that the dowtown area has to offer - nightlife, theaters, shopping, landmarks and more! This home also boasts two balconies, one with a picturesque view of the Barrio Viejo neighborhood and the other, private balcony off the master suite, has the best views of the Tucson Mountain Range and "A" mountain. 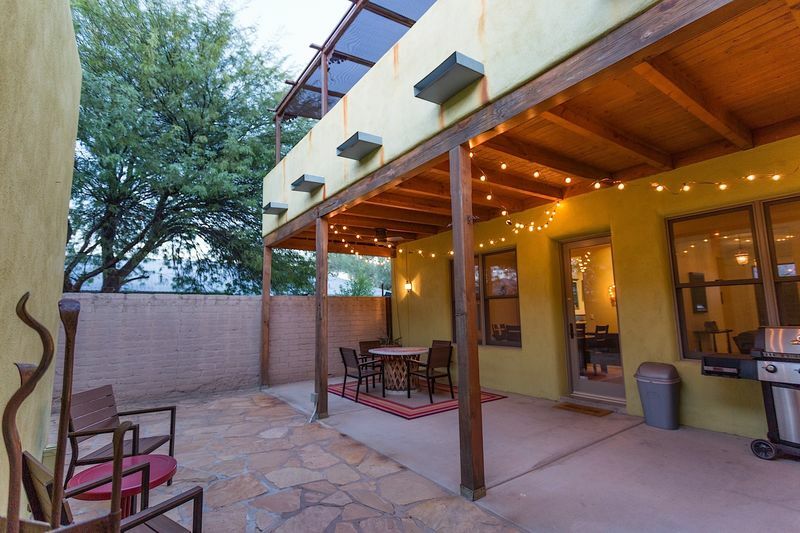 Take advantage of the famous Tucson weather by entertaining in style on the private back courtyard that features a gas grill, cafe lighting, and plenty of dining space. You can also walk to the Tucson Convention center! Making it the perfect place for your GEM SHOW visit! Or for any of the amazing conventions hosted at the TCC! Quick access to the 1-10 allows you to get anywhere in the Tucson Metro area quickly and easily. If you love the unique charm of the Sonoran Desert and the southwest than you will love staying here! Belleza Del Barrio truly is The Beauty of the Barrio in the Old Pueblo!